Has the FTC Already Passed Judgment On Google? There's no question that the government has grown phenomenally over the past decade. Under GWB's and Obama's watch, federal power—particularly emanating from non-elected officials within non-legislative bodies—has enjoyed an increasing level of influence. It's no wonder that public-sector workers' estimation of America's economic health well outpaces that of their private-sector counterparts. One downside to all of this is that this growth creates a near-permanent base that produces little and will only continue to act (not to mention vote!) for the benefit of its own prosperity. One wonders who actually works for whom. The FTC's actions surrounding Google's proposed AdMob acquisition, if the following accounts are to be believed, tell me that the Ahabs at this particular three-letter agency are pretty excited about landing the Great White Web Whale of Mountain View. Will Price, CEO of WidgetBox, a San Francisco-based rich-media advertising startup, said that when an FTC investigator contacted him, he expressed his view that the mobile-advertising market is far from mature and that blocking the deal could harm an emerging industry. But he’s not sure he was heard. “There’s a bit of a subtext, an agenda that comes across when talking to them,” said Price. According to Price, the FTC later sent him a transcript which omitted most of his views favoring the Google-AdMob deal and asked him to sign it and swear to its accuracy. Only after he protested did they send a more complete transcript for him to sign. 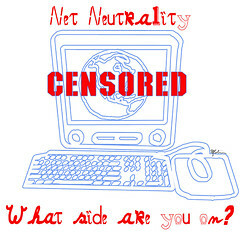 FCC: "Okay, I Dare You to Cross THIS Line"
While I'm still torn on the net neutrality debate, I nevertheless find the FCC's cynical power ploys disgusting. Having received a pretty firm slap on the hand by the courts for presuming to have regulatory jurisdiction of the Internet and ISPs, the FCC—without benefit of Congressional approval or mandate—has decided to reclassify the Internet to ensure that it retains the jurisdiction it was denied. FCC Chairman Julius Genachowski released details of a new plan to reclassify broadband services so that some common carrier rules required by telecom services would apply to broadband. The thought is that reclassifying broadband would put the FCC on firmer legal ground for establishing Net neutrality rules, which are supposed to keep the Internet open and free and protect consumers from companies trying to monkey with their Internet traffic. I'm sure we all wish we could ignore the judicial branch when convenient. Keep in mind that none of us elected the FCC chairman into office, and yet his decrees have the force of law. Chairman Genachowski promises a light regulatory touch. Given the tendency of any regulatory body to expand its purview well beyond its mandate, I have my doubts. Mashable and others are reporting about a ruling by a U.S. Appeals Court that the FCC does not in fact have the power to enforce the net-neutrality compliance of ISPs. Many folks are surprised that I don't reflexively support the concept of net neutrality and, instead, have tended to plant myself in the undecided column. Increasingly, however, I've determined that I ultimately have more faith in the market to work out this particular issue than I do regulators. One issue has to do with jurisdiction, a notion I'm glad to see that the courts support. The FCC—a creaky relic of a long-gone, vacuum-tubed, spectrum-constrained era—simply does not have the mandate to regulate the Internet or ISPs any more than the DMV has the power to regulate the highway system. Every day, infrastructure and equipment providers figure out ways to deliver more bandwidth more cheaply, continuing to humiliate the digital Malthusians out there. Clearly defined regulations are probably unnecessary, but at least they would provide innovators a sense of stability. But [FCC chief Julius] Genachowski's case-specific approach to judging violations—essentially we'll know it when we see it—doesn't even give them that. Now, whenever a telecom company wants to implement a new service or product that works by manipulating traffic flow on the Web, it will have to worry about whether or not its innovation might set off Genochowski's sense of... well, whatever it is that he and the rest of the regulators at the FCC don't like. Personally, I don't think the FCC is serious enough, mandated enough, or capable enough to regulate the Internet. That said, with Howard Stern off the public airwaves and Janet Jackson's right breast now well-concealed from TV cameras, perhaps they're desperate for something to do. One thing is for sure, though: ISPs that throttle traffic in ways that degrade service for the reasonable customer will find their business drop that fast. And it's not like there isn't competition. Reason also points us to the FCC's own data, which shows that 98.3% of ZIP codes had three or more broadband providers in 2008 (PDF, page 21).